The original article as it appeared in “the garter Snake” back in 2004 can also be found on the website of Fons Sleijpen (www.thamnophis.eu). I have rewritten my article and adjusted it with my experiences from the past years. 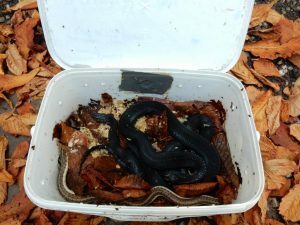 In this article I describe my experience with hibernating Garter Snakes and the methods that I have developed and used for the past 30 years to hibernate garter snakes successfully. The idea to write this article was born since this subject is so often discussed in articles. I had read for instance in The Garter Snake (the magazine of the European Garter Snake association) that people use completely different methods of hibernating their gartersnakes, usually much shorter (see for instance Kreyerhoff (2002) and Buchholz (2002)) then the method I used. But even as of today this subject is very much relevant and intensely discussed on fora and facebook. Many (especially those that are new to the hobby) hobbyists are struggling with what to do in early winter en often get confused because of the overload of (often contradicting) information. Practically every starting hobbyist finds it very scary to hibernate their little Garter Snakes. But even many more experienced hobbyists see the hibernation period as a challenging period. In general many people put drinking bowls in the hibernation terrarium and keep the substrate relatively dry. And I do not know many who hibernate the very small juveniles in their first winter. 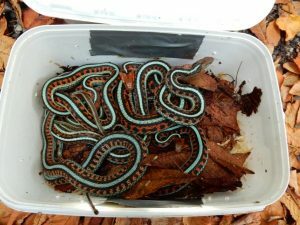 I hope my experience can help other garter snake keepers with hibernating their favourite snakes in a successful way without losses. In my opinion, partly based on several journeys to the US and Canada visiting the different garter snake habitats in different seasons, hibernation is a crucial part in the life of garter snakes. All snakes, juveniles or adults, need to survive the sometimes harsh winter conditions. Those that do not succeed will never make it until adulthood and will never participate in mating. The natural selection pressure is extremely high. 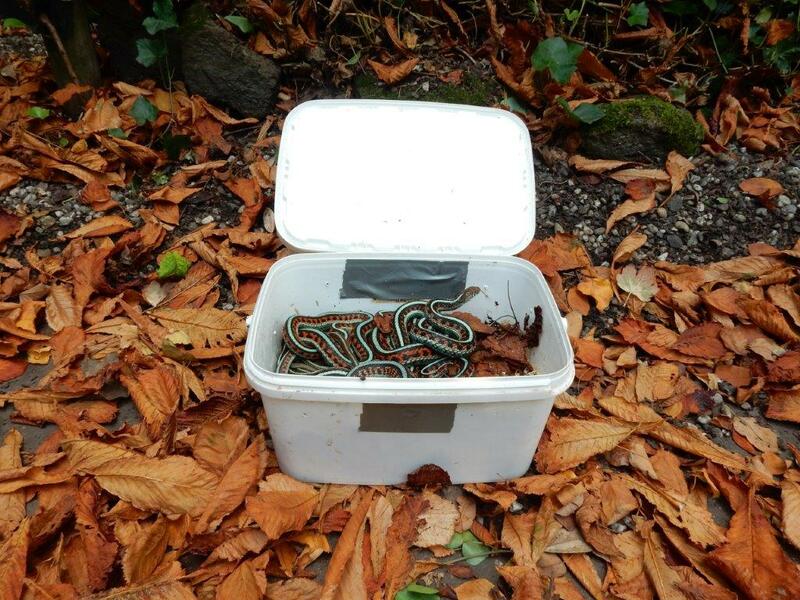 So keeping your garter snakes warm year round seems very unnatural to me. Just like being awake 24 hours a day without sleeping. This also counts for garter snakes from regions which are considered as southern without a cold winter like Thamnophis sauritus sackenii from Southern Florida or Thamnophis sirtalis tetrataenia from California. Visiting their natural habitats during winter time reveals no or hardly any activity, except on some of the warmer winter days. Hibernating garter snakes is very important when you want to breed them consistently, even though there are plenty of examples of successful breeding results without a hibernation. When you should start with hibernation? I partly let the snakes themselves decide when to start with hibernation. Studying their behaviour can give some clues. 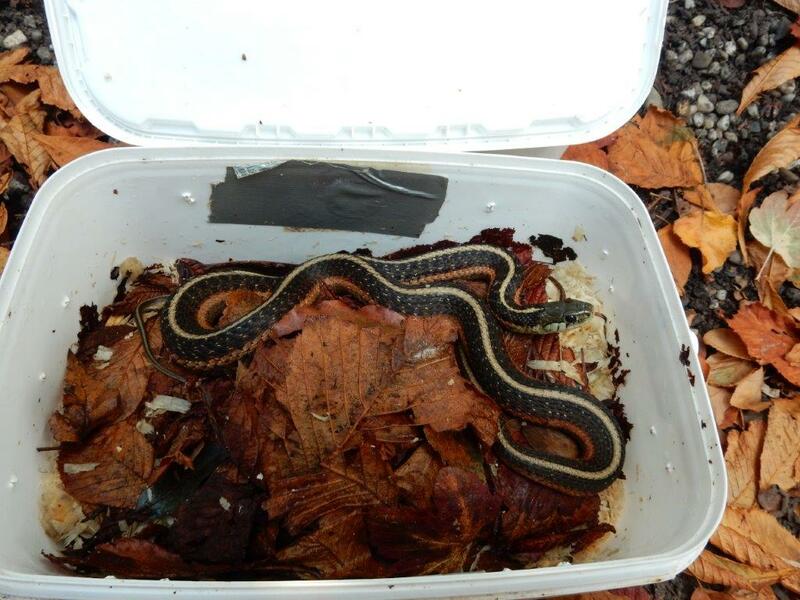 Thamnophis elegans terrestris adult during hibernation in a larger container. Somewhere in the fall it is noticeable that the snakes slow down their feeding frequency, eating only small amounts or that they stop feeding altogether. This often happens somewhere in October or November in my current snake room. Because I keep my snakes in an unheated room the dropping temperatures outside influence the temperatures in the room and in the terrarium. But the better your room is isolated and the more terraria are in the room the less the room temperatures are influenced by outside temperatures. Years ago my snake room was far less isolated and hence much colder in September/October then my current snake room; the snakes stopped feeding often as soon as end of September. During the summer months of June – August the night temperatures almost never drop below the 21 – 23 °C at night. But when the nights start to cool in September room temperatures can drop to 18 – 19 °C at night (terrariums are only heated during daytime), and later in October and November the temperature drops further to 15 – 18 °C or even less. I believe that this cooling off during night triggers the snakes to prepare for hibernation.. Retreating to the coldest part of the terrarium under stones or leaves and not or hardly showing themselves to sun during daytime. Crawling seemingly restless through the terrarium, rubbing the snouts against the glass. Apparently looking for a good place to hibernate. Higher mating activity during days which are a bit warmer then usual for the time of the year. Normally little mating behavior can be observed in the summer months, but as soon as the nights start to cool down mating behavior gets more frequent and intense. Not all snakes stop feeding out of their own, and at a set date I stop feeding altogether. This is usually somewhere between the beginning of October and the beginning of November. The exact timing can be influenced by what suits me best. If I have a busy fall I stop feeding a couple of weeks sooner for instance. I also try the spread the timing when the different species enter and leave hibernation in order to prevent that all the females have their offspring simultaneously in spring and early summer. After the last feeding activity I keep the lights (and heat) on (during daytime) for another 7 – 14 days, in order to give the snakes the opportunity to fully digest their last meal and empty their intestines. If the snakes go into hibernation with food in their intestines it is likely to start rotting which can be fatal for the snakes. It is better to let the snakes go without food for some extra weeks then to run the risk of food remaining in their intestines. Since some snakes already stop feeding before I offer their last meal of the year, it can easily happen that some snakes have not eaten for 4 – 6 weeks before the lights are switched off. I have never had any problems with snakes that stopped feeding several weeks earlier before entering hibernation: in captivity even the less well-nourished snakes are in general much fatter than many of the garter snakes I encountered during my trips to the US and Canada in fall. Which snakes go into hibernation..? In the article I wrote in 2004 the answer to this question was: “All my Garter Snakes go into hibernation”. But back then my collection consisted mostly of species from Canada and the USA. In the last years I added several Mexican species to my collection, like T.melanogaster canescens, T.eques spp., T.scalaris, T.scaliger and T.conanti. For these Mexican species my traditional method of hibernation is not suitable. But I will get back with that later. When snakes are in their shedding period I keep them warm until they have shed their skin. So this means postponing the start of the hibernation with 1-2 weeks, without offering food. I have never had any pregnant snakes in this time of the year, with the exemption of some of the Mexican species. This is probably because of the fact that I try to mimic the natural seasons as much as possible. So pregnancy has never been a reason for me to skip hibernation. But of course, if you have a pregnant snake I would always advice to keep her warm until she gave birth. Young of the year all go into hibernation. Even when they are born late in the year like in August or September or when they are very thin. I know many people are afraid to put young born snakes in hibernation during the first winter. It is often considered as a big risk. I like to put it the other way round. When young snakes are very thin and when they are not feeding very well I like to put them into hibernation. My experience is that when they survive the hibernation they will start feeding very well and do much better. I do however shorten the duration of the hibernation time for young snakes, especially when they are thin. For instance to 4 weeks. If babies are feeding poorly I also intend to put them into hibernation earlier in the year, sometimes as early as September or October. At the moment I use three different methods for hibernation. For the first method I use an old refrigerator or my garage. The temperature inside the fridge is 4 – 8 °C during the entire time. In my garage the temperatures in the winter vary from 0,5 – 14 °C depending on the fluctuations outside. Only if the temperatures are starting to drop below the 0°C I take the snakes out of the garage and put it on the coldest spot in my house at that time for a few days until the cold spell is over. 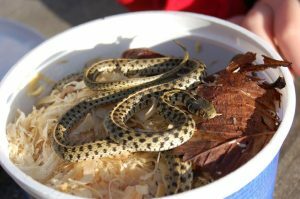 The snakes go into relatively small containers, which are either of plastic or of metal (for instance old cookie jars). For juveniles I use small jars, with a diameter of 9 – 11 cm and a height of 7 cm. 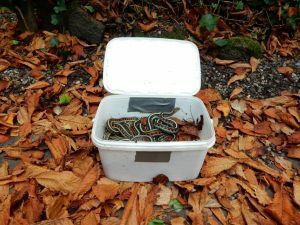 For my adult snakes (mostly hibernated in groups of 2 – 6 snakes) I have been using in the past 10 years plastic square buckets of 27 x 17 x 15 cm (lxwxh). Previously (as you can read in my original article) I used smaller containers, but I prefer a little more space now. The lids or sides are perforated with a few small holes, just enough for some air exchange but not so much that the content dries out too quickly! Preventing the “drying out” is extra important when in the fridge. The containers are filled with a mixture of sawdust and fallen leaves (collected in my garden). When putting the snakes in the container I moisturise the content by sprinkling some water in the container. 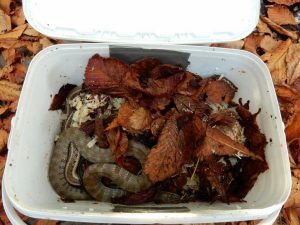 I normally check on the snakes every 2 – 4 weeks, and I like to see the inside of the lid wet from condense water. It this is not the case I spray more water in the container: too wet is never a problem, but when the containers are too dry snakes tend to dehydrate (especially in the fridge) and loose a lot of weight. Some times the snakes are totally wet from the condense water.Inside the containers I never put a bowl with drinking water.This method I use or have used for all garter snakes from the US and Canada. All subspecies of Thamnophis sirtalis I have kept, Thamnophis ordinoides, Thamnophis radix, Thamnophis elegans vagrans, T.e.arizonae, T.e.terrestris, T. atratus, T.rufipunctatus etc. Of the Mexican species I only hibernate T. eques virgatenuis with this method. But also the european Viperine water snake (Natrix maura), the Northern Water Snake & the Lake Erie Water Snake (Nerodia sipedon sipedon & N.s.insularum) are hibernated this way. In my original article I have described a method that was based on hibernating the snakes as described above, but then in my unheated snake room. But since the temperatures have rarely dropped below the 14 °C in the recent years I decided to stop this method and to hibernate all species really cold. 14 – 20 °C is really to warm to hibernate most species successfully. The second method is hibernating the snakes simply inside their own terrarium in the unheated snake room with the lights and heating switched off. Temperatures fluctuate of course based on the outside temperatures. But beside the fact that the temperatures are always much higher than method nr 1 (and rarely below the 10 – 14 °C) this method also differs from method nr 1 in the fact that the snakes are not exposed to high humidities. The snakes remain in a completely dry terrarium with a bowl of water to drink from. I do use this method sometimes for some Mexican Garter Snakes but always for the North American water snakes originating from southern locations (Nerodia erythrogaster transversa and N. rhombifera rhombifera). These snakes are more sensitive for moisture, and if they are hibernated in the same containers as the garter snakes they tend to get blisters, eye inflammations and other skin problems. 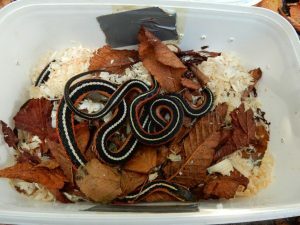 I just mentioned that I use this method for some of the Mexican Garter Snakes (Thamnophis eques ssp); usually I give them the possibility to bask for some hours under a cooler lamp during the winter months (which they sometimes ignore and not use for weeks) but sometimes I switch of the heating and lights for 2 – 4 weeks. During the cooler winter months, either with or without a heat source, Thamnophis eques sometimes uses the water bowl to remain practically completely submersed for days or weeks in a row. A new third method I have started using only in the past 2 years in an attempt to mimic the natural circumstances in which some rare highland Garter Snake species live on high altitudes in Mexico. For this I build some terraria in my unheated shed. A part of the terrarium is filled with a 10 cm thick layer of slightly humid cocopeat. These terraria are heated during daytime by a strong reflector bulb that is switched on for about 8 hours a day. This way the snakes get the change to bask during daytime for a few hours at local temps of 25 – 30 °C. But in the thick layer of cocopeat the temps usually stay below the 10-15 °C during daytime and cool down to 2 – 10 °C during the cold nights. I keep them in this cold shed for 1 – 3 months and then they go to my snake room inside the house. So far I have gained some experience with this third method with Thamnophis scalaris, T. scaliger, T. conanti and T.pulchrilatus. Sometimes the snakes remain hidden for a few days or even a week in a row, but then they bask for a couple of hours. After switching out the lights and heating in the winter or fall, when using method 1, I put the snakes sometimes directly, sometimes after a few days but sometimes even after several (up to 6) weeks in their hibernation buckets or containers. This way all the snakes experience a shorter or longer period of hibernation method 2 (in the unheated terrarium), before they are moved to the fridge or garage. In table 1 the duration of hibernation for the different species are noted. I start counting the weeks as soon as the lights are switched of in October/November. So if for example a snake stays in the unheated terrarium for 5 weeks and then for 15 weeks in a moist container in the fridge the hibernation period will be marked in table 1 as 20 weeks. 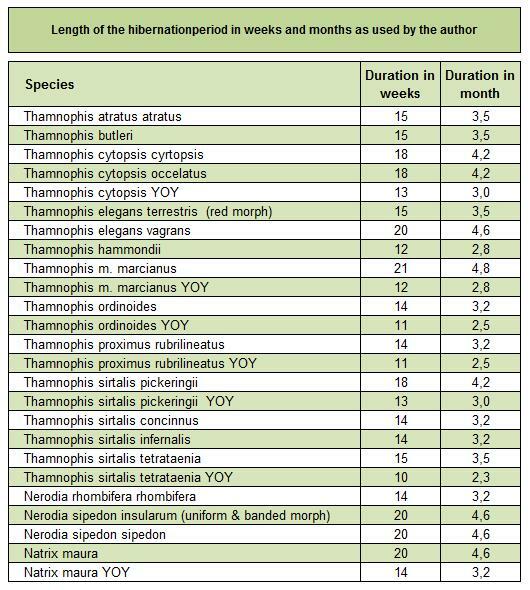 On average the juveniles (YOY = Young Of the Year) are currently hibernated for 6 – 8 weeks, but in the past this was 8 – 13 weeks. For the adults the hibernation period is much longer, 3,5 to 4,5 months average. The maximum I have done so far is for Thamnophis marcianus: 4,8 months. The reason I have hibernated T.marcianus this long is twofold: I often see that the adults Checkered Garter Snakes tend to get very well nourished (fat), and I have never come across such well fed snakes in the wild. Beside this I know that some species like T.marcianus and T.cyrtopsis are, especially in western Texas where I have done lots of observations myself, living in habitats with food available only for a short period during the year, and they are adapted for surviving long periods without food. I have actually never seen big losses during hibernation. Sometimes an occasional snake dies during hibernation. For example in the winter of 2002/2003 of the 50 adult and subadult garter and water snakes only 1 died (2 %). This was an old male (8 – 10 years) of the Wandering Garter Snakes who had been not fit for some time. Over the last 10 years I estimate that 5 % was the highest mortality rate, but on average it was probably close to 1 – 2 %. Of the juvenile snakes (YOY; less than 6 months old) the mortality rate was higher! In the winter of 2002/2003 9 of the 41 juveniles died during hibernation (21 %). This is quite substantial. But when analyzing the data something has to be said. 13 of the 41 juveniles were belonging to the species Thamnophis sirtalis semifasciatus and T. radix which were born in my outdoor terrarium somewhere in August/September but they were caught and put inside quite late (beginning of October). The weather had been bad in fall and the young snakes had hardly or not eaten after birth and were in poor shape when caught. 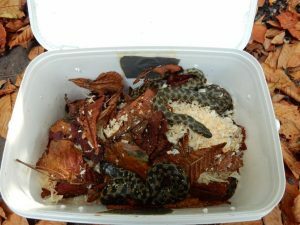 Then they were offered some food for a couple of weeks in a heated terrarium but their biorhythm was already in hibernating stage (combined with the cold nights temperatures in my unheated room) and most refused to eat. Of this group (which were very, very thin and tiny) 7 died (53 %). Of the remaining 28 juveniles which were all born much earlier inside (June-August) and which had all eaten for at least 2 – 4 months only 1 died (4%). Over the last 10 years or so the mortality rates of the juveniles born inside has not been much higher than 5 %! 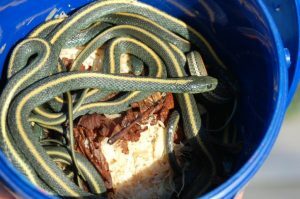 When the garter snakes are hibernated the way described above the loss of weight is often minimal, and the snakes appear to be in good shape after hibernation. Normally I weigh the snakes before they are put in the hibernation jars and also afterwards when they are put into the warm terrarium again. Although the “kitchenweigher”is not super accurate (accurate at 1 gram level) I give some measurements as an example. Five adult Santa Gruz Garter snakes (Thamnophis atratus atratus), 1 male and 4 females, lost in 2015/2016 after a hibernation period of 3 months (method 1) 14, 9, 9, 16 and 20 % of their bodyweight. An adult couple of Butler’s Garter Snakes (Thamnophis butleri) lost in 2015/2016 after a hibernation period of 3 months (method 1) 8 and 0 % of their bodyweight. An trio of Coast Garter Snakes (Thamnophis elegans terrestris) lost in 2015/2016 after a hibernation period of 3 months (method 1) 5, 7 and 0 % of their bodyweight. 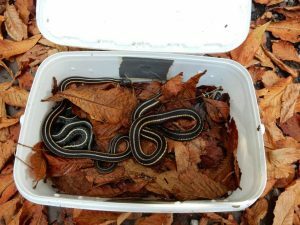 Five adult Oregon Redspotted Garter Snakes (Thamnophis sirtalis concinnus), 3 males and 2 females lost in 2015/2016 after a hibernation period of 3 months (method 1) 12, 0, 0, 3 and 6 % of their bodyweight. When snakes loose a lot of weight during hibernation it is often a matter of dehydration. Then the humidity inside the jar has been too low. The procedure to end the hibernation is usually quite abrupt. After the period which the snakes were suppose to hibernate is over I put them right into the terrarium, and turn on the light (= heat) or sometimes the lights have already been on during a couple of hours. When the snakes end their hibernation already in February the snake room temperatures are (especially in the nights) usually quit low (14 – 17 ° C) so the transition is not so big. But local temperatures in the terrarium can be as high as 30 ° C or even a little more. A gradual change from low temperatures towards higher temperatures is not considered as essential to me, and in the wild it is usually vary abrupt as well. In the wild the den temperatures can easily be as low as 1 – 8 °C when snakes leave the den to sun themselves. When the snakes leave the den around noon and crawl towards a sunny spot to heat up they can reach the 25 – 30 °C easily within minutes… And the same late afternoon when the sun is going down and they retreat in the den they cool down to 1 – 8 °C, so big fluctuations in body temperature are very normal. And in some areas these huge fluctuations in body temperature occur daily in early spring. A nice graph of these daily body temperature fluctuations in early spring can be seen on page 81 of the magnificent book of Rossman et all (1996). Garter snakes can be hibernated in relatively small containers without many ventilation holes. A high humidity and a slightly moist substrate is important to prevent dehydration. Before hibernation the intestines should not contain any food items. Garter snakes of all ages, young and old can be hibernated successfully with the methods described above. Duration of hibernation and temperatures during hibernation are mentioned. For me, hibernating Canadian and American species of Garter Snakes is not an option but a must. Why? Because it is natural, because it enhances the chance of successful reproduction and because it is convenient (a period without feeding and taking care of the snakes). 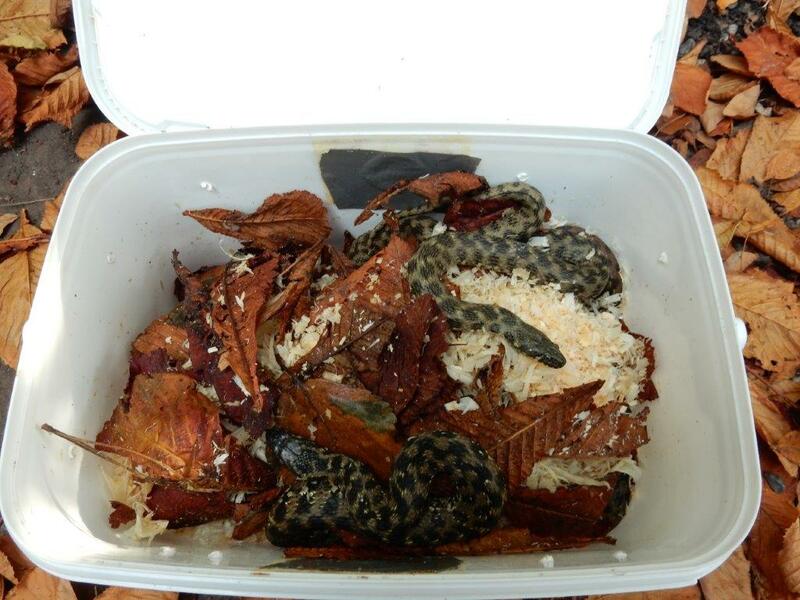 One of the results is a synchronized biorhythm: the snakes within the same terrarium shed their skins for the first time within a narrow time frame (often the second shedding is already more spread out) and females within the same terrarium also give birth closely after each other (sometimes within days). So I would like to recommend a lengthy hibernation period for garter snakes. Don’t be too scared too quickly: the snakes have adjusted to a hibernation period in the wild for thousands of generations. Natural selections selected those snakes who could survive the winter period, and there is no escape possible from the sometimes harsh winter conditions in the wild. So hibernating comes natural to them. Buchholz, T, 2002. Bei mir zu Hause. The Garter Snake 3 (02): 53-55. 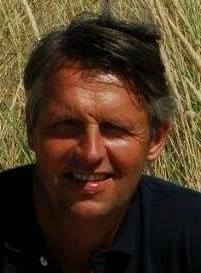 Kreyerhoff, H, 2002. Verluste bei der Uberwinterung. The Garter Snake 4(02): 35. Rossman, D., N. Ford & R. Seigel, 1996. The Garter Snakes. Evolution and ecology. University of Oklahoma press, Norman, Publishing division, USA.